The first weekend in October is always one of my favorites in the year. It’s Shriekfest, three days of low (and micro) budget horror features and shorts, with plenty of heated genre discussions between screenings at the Raleigh Studios. And this year there was a great food truck on site. Shriekfest showcases the kind of movies that will never make it to local multiplex screens. They’re usually labours of love, funded personally and piecemeal. Most focus on a single location, with a limited number of characters, and are shot on a really tight schedule. Whatever budget there is (and that’s often less than $100K for a feature) is mostly thrown at practical special effects – this is horror, after all, and the stories demand buckets and buckets of blood. These are the kind of constraints that inspire genuine creativity. There are no easy answers or quick cash fixes. Film-makers are dealing with raw story and only the most basic of film-making tools in order to communicate with their audience. The resulting entertainment puts big budget studio movies to shame. The Moleman of Belmont Avenue, a horror comedy, follows the misadventures of bumbling brothers, Marion and Jarmon Mugg, as they attempt to eradicate a basement-dwelling pest from the apartment building they inherited from their mother. A sharp and inventive script, two excellent central performances (from John LaFlamboy and Mike Bradecich), and a lively supporting cast (including Robert Englund) make this a gem from beginning to end. Isle of Dogs, a stylized and bloody tale of revenge, won the Best Thriller award. The narrative starts out as a typical gangster flick, all about testosterone and disputed women, but it spirals upwards into Jacobean tragedy. Barbara Nedeljakova (Hostel), Edward Hogg (Bunny and the Bull) and Andrew Howard (I Spit On Your Grave, Limitless) relish the material and deliver dynamic performances from the top all the way through to the blood-soaked, Grand Guignol climax. Best Horror Feature went to Absentia, a low budget but nonetheless chilling supernatural thriller. This tale of two sisters in suburban Los Angeles provides a great example of a simple story simply told. The horror derives from the modern mundane – a pedestrian tunnel under the freeway – but incorporates myths from many different cultures in order to tap into the audience’s primal fears. In the current climate of remakes, rehashes and plain ol’ regurgitation spewed out of Hollywood by the studio machine, it’s always refreshing to be reminded that there are film-makers out there with the ability to tell an original story in a fresh way – and spend less than most studio movies’ catering budgets in the process. 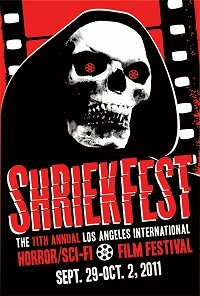 Kudos to Shriekfest for bringing the best of independent horror to a wider audience.